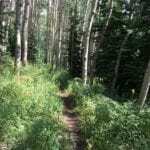 This is a really fun expert ride in Cement Creek that connects to Walrod Gulch and the Waterfall Trail and Cement Creek Trail for a great 17 mile loop, 9 miles of that being singletrack. The trail is pretty narrow with some exposure, with awesome views. A CB South locals favorite! It is fun in either direction but climbing up Walrod is easier according to most! Park at the 409 trailhead 1.7 miles up Cement Creek Road. Ride up Cement Creek Road to a singletrack on the left, and follow this to Walrod Gulch. 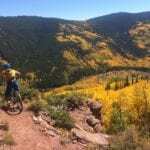 Ride up Walrod Gulch Road past the Caves trail, to the Walrod Gulch Trail ( 3miles from the Trail 409 parking area.) Continue up (hike a bike, then ride) to a junction with 405.2A and 405.3a. (4.5 miles total so far.) Continue straight ahead, cross a creek and swing right to climb a steep hill (worked on last year by CBMBA so it is now all rideable by the strong and tough!) continue straight at the next intersection onto the Waterfall Cutoff trail, which is now nonmotorized and newly worked on also. Have fun! when you reach a T-intersection, go up a few feet and immediately right. Continue contouring on the Waterfall Cutoff Trail. At 8.3 miles intersect the Waterfall Trail, turn right and zoom down to the Cement Creek Trail and head right. Take this back to the road and your car. Or turn left on Cement Creek Trail and head out to Crystal Peak or Hunter Hill for more fun. Jimmy and Greg Faust have been providing distinctive, high quality mountain home construction in Crested Butte since 1992.